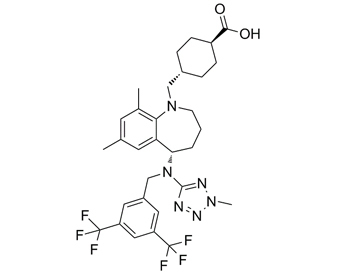 Evacetrapib, also known as LY2484595, is a CETP inhibitor currently under development by Eli Lilly & Company. LY2484595 inhibits cholesterylester transfer protein, which transfers and thereby increases high-density lipoprotein and lowers low-density lipoprotein. It is thought that modifying lipoprotein levels modifies the risk of cardiovascular disease. The first CETP inhibitor, torcetrapib, was unsuccessful because it increased levels of the hormone aldosterone and increased blood pressure, which led to excess cardiac events when it was studied. Evacetrapib does not have the same effect. When studied in a small clinical trial in people with elevated LDL and low HDL, significant improvements were noted in their lipid profile.
. Cao G, et al. Evacetrapib is a novel, potent, and selective inhibitor of cholesteryl ester transfer protein that elevates HDL cholesterol without inducing aldosterone or increasing blood pressure. J Lipid Res. 2011 Dec;52(12):2169-76.